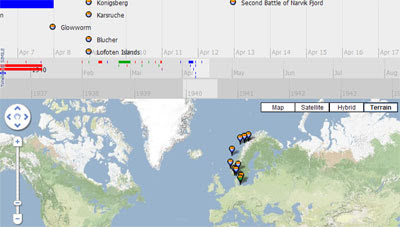 The World War Two Timeline Project is an interesting attempt to chronologically and geographically, map the events of World War Two using the open source Simile Timeline. Using the map it is possible to view the major events of World War Two on a Google Map. You can use the timeline, at the top of the map, to plot the progress of the war on the map. It is also possible to navigate the events of the war via tags. These tags include countries as well as subjects such as naval, aerial and land. The map creators say they have not finished adding data, so this map should become an even more useful resource over time.